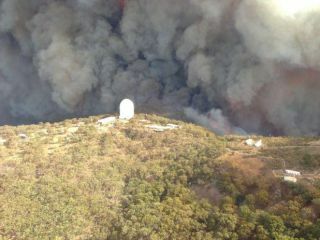 The Wambelong fire threatened Australia’s Siding Spring Observatory in January 2013. A massive wildfire has damaged Australia's largest optical astronomy facility, the Siding Spring Observatory, causing significant damage, observatory officials said. All of the 18 people on site were evacuated safely, but five buildings, including a visitors center and lodge, were significantly damaged during the Wambelong fire, Erik Lithander, vice-president of Australian National University, which owns the facility, said during a press conference Sunday (Jan. 13). "The decision has been made to close the Siding Spring Observatory for an initial two-week period to allow us to carry out a full assessment of the damage caused by the fire and to ensure that the site is safe for staff prior to their return," Lithander said. A team will begin investigating the buildings on site in the next week, to see how badly damaged the 12 telescopes at the facility are. Fire approaching Siding Springs Observatory near Coonabarabran in January 2013. "An initial visual assessment shows that there does not seem to be significant damage to the buildings that house the telescopes," Lithander said. "We do not yet know what impact the extreme heat and the ash might have on the telescopes themselves, and we won't be able to carry out that assessment until we can enter the buildings and we can inspect the inside of them." Siding Spring Observatory stands on a site 3,822 feet (1,165 meters) above sea level on Siding Spring Mountain, also known as Mount Woorat, in the Warrumbungle National Park, outside of the town of Coonabarabran in New South Wales. Australian National University had plans to build new telescopes at the facility by 2015, but the damage sustained during the fire could put those plans on hold. This isn't the first time wildfires have threatened Australian observatories. In 2003, raging fires caused $12 million (U.S.) worth of damage to the Mount Stromlo Observatory, located very near the Siding Spring Observatory, and made a near miss of the Canberra Deep Space Communication Complex, part of the worldwide Deep Space Network of radio antennas.